Welcome to the GPCRdb (G Protein-Coupled Receptor database) acknowledgement page, which has two sections written by the current and former heads of GPCRdb, David E. Gloriam and Gerrit Vriend, respectively. Firstly, we would like to thank the founding father and two-decade protector of GPCRdb, Gerrit Vriend for so generously giving us the database as a gift without reservations. We promise to do the best to build on its legacy, going forward in the spirit of engaging and serving the GPCR community. The former lead developer Bas Vroling played a large role in making the transition of the data and previous codebase possible. 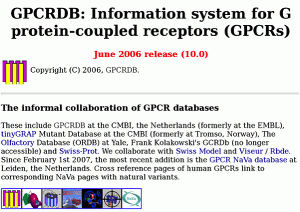 The first Copenhagen version of GPCRdb was the Tools subsite published in NAR, 2014. This sprung mainly from a series of computational drug design data and tools developed by Vignir Isberg during his PhD studies. As a lead developer he has driven the database far beyond anticipation, coordinating a team of international developers with enthusiasm and persistence. The past and current members in the Gloriam group have preserved the cross-fertilisation between developers and users. Kasper Harpsøe has taken a main role in the user expertise and development of the new format for mutant data submissions and storage. With the risk of forgetting someone along the way to the current wholly re-coded current version, we simply refer to the author lists of the various GPCRdb publications. GPCRdb would not have been where it is without the GLISTEN EU Cost Action, coordinated by Peter Kolb and Chris de Graaf. You brought us into the party – allowing us to have satellite meetings for the international GPCRdb developers and contributors at each of the biannual GLISTEN meetings. The local organisers have so kindly provided room and practical coordination. Furthermore, the GLISTEN financial support made possible a number of in- and outgoing short-term scientific visits to set-up and build collaborations. A big thanks goes Andrzej Bojarski and his group to whom we own thanks for most of the work behind the GPCRdb structure tools and phylogenetic trees. You generously shared so much of your time, and arranged for short- and long-term visits to facilitate the joint programming. The whole GuideToPharmacology team is acknowledged for its openness to setting up our collaboration with mutual cross-linking, web services and GPCRdb’s adoption of the official receptor nomenclature. You have served as a true inspiration from a much larger resource that has walked many of the paths of database development and curation before. Finally, we would like to extend thanks to newly established collaborations. Xavier Deupi and his lab are acknowledged for choosing to work with GPCRdb, while sharing the local expertise. We thank Raymond C. Stevens and Michael Hanson for welcoming GPCRdb as a partner to the GPCR Consortium, which holds great promise to be synergistic resources/initiatives. The GPCRdb was started in the early 90’s when Bob Bywater, Ad IJzerman, Friedrich Rippmann, and Gert Vriend organized a series of small GPCR workshops at the EMBL. Before the introduction of the first browsers, the GPCRdb worked as an automatic Email answering system that could send sequences, alignments, and homology models to the users. In 1994 the internet was firmly established in its present form, and money was obtained from the fourth EU framework to set up the GPCRdb. Florence Horn joined us to do this project. When she left us at the end of a four-year post-doc period the GPCRdb was firmly established as the prime source of information for GPCR data. Figure 1. GPCRdb until 2006. In 2007 TIPharma offered us the possibility to revive the GPCRdb. Bas Vroling joined the team and revived the GPCRdb. We would also like to thank NBIC for their support. This page would not be complete without Laerte Oliveira. Ever since the start of the GPCRdb project Laerte has been our GPCR dictionary. He knows the literature, he knows all sequences by hearth, he is responsible for the alignments, and for a series of innovations. Laerte recently retired, but he is still our full-time adviser. Many people have contributed over the years to the shape of the GPCRdb that you see now. Rob Hooft was, en Maarten Hekkelman now is our bit and byte guru. Maarten also wrote the profile BLAST. Fabien Campagne wrote the snake plot software for us. Margot Beukers, Fred Cohen, Oyvind Edvardsen, Kurt Kristiansen, have been involved in the mutant section of the GPCRdb; Oyvind and Kurt made tinyGRAP that now is integrated in the GPCRdb. Wilma Kuipers, Nora vd Wenden, Mike Singer, and Frank Kolakowsky were good colleagues and intellectual sparring partners that helped shape the GPCRdb in its early days. Lisa Holm, Karl Aberer, Amos Bairoch, Nigel Brown, Antonio Paiva, Thure Etzold, and Antoine Daruvar have over the last two decades all contributed to the GPCRdb.